220 CE: the fall of the Han dynasty is a convenient marker for the end point of the ancient period of Chinese history. China is a vast country with a huge range of terrains and climates within it. As well as the country’s sheer size, geographical features such as mountain ranges, deserts and coastlands have all helped shape Chinese history. Above all, the great river systems of China, the Yellow River to the north and the Yangtze to the south, which have given Chinese civilization its distinctive character. The civilization of ancient China first developed in the Yellow River region of northern China, in the 3rd and 2nd millennia BCE. A large part of this area is covered by loess soil. This very fine earth has blown in from the highlands of central Asia over thousands of years, and makes one of the most fertile soils in the world. In ancient times, the main crop in northern China was millet, a highly nutritious food still grown in many parts of the world as a major crop. To the south, the great Yangtze valley, with its warm, wet climate, was the first area in the world where rice was grown, sometime before 5000 BCE. From this region rice cultivation spread far and wide across southern China and into south-east Asia. Rice is one of the most nutritious plants known to humans – three or four times as nutritious as wheat. This means that, other things being equal, a much larger number of people can be supported from the same area of land with a rice crop than with a wheat crop. Away from the great river valleys, hills, forests and swamplands covered much of China at this time. These would later be covered by dense populations of farmers, but in ancient times these regions were home to many small groups of people who practised some farming, but who also hunted animals and gathered plants for a living. The hilly or swampy landscapes of these regions were not really suited for intensive farming; it would not be until pressure of population elsewhere encouraged landowners and peasants to make the investment needed to prepare the land sufficiently for cultivation. This would involve clearing forests, terracing hillsides and draining lakes and marshes. To the north and west of the Yellow River region are the wide plains of central Asia. Here, the harsh deserts and dry grasslands are unsuitable for growing crops, and the inhabitants’ traditional economy has been based on pastoralism. Although this landscape has not been able to support a large population, the people’s nomadic lifestyle has made them inured to the dangers and hardships of war, and throughout China’s history, starting early in the ancient period, the Chinese have faced recurrent threats from this quarter. Farming was possible in central Asia only in the scattered oases. From an early date, these hosted villages which were in contact with one another, in a chain covering thousands of miles across Asia, right to the Middle East and beyond (what would much later be called the “Silk Road”). Along this chain, luxury goods were exchanged and new techniques learned about. Modern scholars believe that skills in working with metals, and in particular, making bronze objects, came to China from the Middle East via this route. The Yellow River region is regarded as the Cradle of Chinese Civilization. It was here that the earliest Chinese dynasties were based. Indeed, throughout the ancient period of China’s history it was the Yellow River region which formed the heart of the Chinese world, and it was from here that Chinese civilization spread out into adjacent areas, including the Yangtze region. By the end of the Han dynasty, the final chapter of ancient Chinese history, all of modern China except the outlying regions of Tibet, Xinjiang, most of the northeast (what was Manchuria) and parts of Yunnan in the south-west had been more or less incorporated into the world of Chinese civilization. The Xia Dynasty (2070 BCE – 1600 BCE) is the first dynasty in China to be described in ancient historical chronicles. The Records of the Grand Historian and the Classic of Rites say that Yu the Great, the founder of the Xia dynasty, was the grandson of Zhuanxu, one of the legendary “Five Emperors” who were the first rulers of China. Yu was successful in stopping devastating floods and increased the produce from farming (since the floods usually destroyed the crops), and the Xia tribe’s influence strengthened. He was made the leader of the surrounding tribes, and soon afterwards was sent with an army to suppress a tribe which was causing trouble on the kingdom’s borders. He won a great victory, which further strengthened his power. Shun, the last of the “Five Emperors”, was getting old, and abdicated the throne in favor of Yu, whom he deemed worthy. Yu’s succession as the king marked the start of the Xia dynasty. Shortly before his death, instead of passing power to the person deemed most capable to rule (as had been the case in the past), Yu passed power to his son, setting the precedence for dynastic rule. 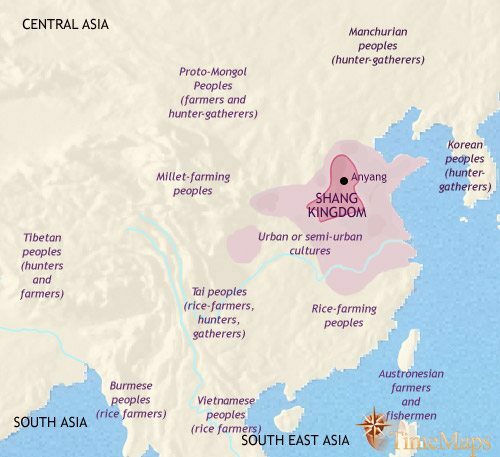 Prior to the coming of cities and literacy (the hallmarks of Ancient Chinese civilization) major Stone Age farming cultures had grown up in China since the 7th millennium BCE. One was located in the Yellow River region, the other in the Yangtze region. In the Yangtze, an agriculture based on rice cultivation had developed, whilst in the north, the Yellow River region, millet was the main crop. The Yellow River region was the setting for the emergence of Chinese civilization into the light of history. A large area of northern China is covered by loess. This very fine earth has blown in from the highlands of central Asia over thousands of years, and makes one of the most fertile soils in the world. In ancient times, the main crop in northern China was millet, a highly nutritious food still grown in many parts of the world as a major crop. Based on this staple, a flourishing Stone Age agriculture developed. By c. 4000 BCE, walled and moated towns had appeared. They continued to grow in size. In the Yellow River region, what looks very much like primitive Chinese characters had also appeared, inscribed on pottery. These characters became more complex as time went by. Other technical advances included the introduction of the potter’s wheel (sometime after c. 3500 BCE), and the production of high quality jade ornaments (after c. 2500 BCE). Finds of luxury grave goods and the remains of large and complex buildings show that a wealthy ruling elite stood out from the population at large. Metallurgy reached China sometime around 2500 BCE, almost certainly from the Middle East via central Asia. At first this was restricted to copper work, but by c. 1800 BCE, knowledge of bronze casting had entered the Yellow River Valley. At around the same time there was a dramatic increase in the size and density of some walled towns in that region, the earliest-known cities in East Asia. By this date the Yellow River region had in fact seen the appearance of a fully urban, literate, Bronze Age civilization, and ancient China finally emerges into the full light of history under the first of its historic dynasties, the Shang. Most of the history of Chinese civilization, including the ancient period, has traditionally been divided into dynasties. A dynasty is a line of kings or emperors from a single family, following each other on the throne from generation to generation. In Chinese history (in contrast to European history) the succession was, in the overwhelming majority of cases, from father to son. This was because, due to the dictates of ancestor worship, it was a ruler’s overriding responsibility to produce a male heir. Not to have done so would have been unthinkable. At times throughout Chinese history, the huge country has been united under a single emperor. At other times, several competing dynasties have divided the country between them. It is only the ones who have ruled the entire country, however, which have been accorded true legitimacy by Chinese historians. The situation in ancient China was slightly different, in that for much of the ancient period what would later be known as “Chinese civilization” was only gradually spreading across the area which today we know as “China”. Thus the early dynastic rulers of China are known as kings, rather than emperors. It is only after the time of the First Emperor, Qin Shih Huang, who reigned over a united China from 221 BCE, that the imperial period of Chinese history began. Archaeologists have uncovered urban sites, bronze implements, and tombs that point to the possible existence of the semi-legendary Xia Dynasty at locations cited in ancient Chinese historical texts. In 1959, a site located in the city of Yanshi was excavated containing large palaces which some archaeologists have identified as the capital of the Xia dynasty. Unlike the oracle bones of the Shang dynasty, there are no written records from the period to help confirm the Xia dynasty’s existence. Through the 1960s and 1970s, archaeologists have continued to uncovered urban sites, bronze implements, and tombs at locations linked to the Xia in ancient Chinese historical texts. At a minimum, the Xia dynasty seems to have marked an evolutionary stage between the late neolithic cultures and the later Chinese urban civilization of the Shang dynasty. The Shang dynasty period saw further strides in material culture, and some of the finest bronzes in world history were produced by Chinese craftsmen of the period. In due course, the Shang dynasty was succeeded by a new line of kings, of the Zhou dynasty. Under the early Zhou (or “Western Zhou”) the cultural and political reach of ancient Chinese civilization expanded enormously. This, however, resulted in fragmentation. The authority of the Zhou kings declined, and the later Zhou (or “Eastern Zhou“) dynasty period was characterised by warfare between increasingly large and powerful regional states. The later Zhou period was not one of simple destruction. Important innovations began to emerge which were to characterise Chinese civilization throughout most of its history, not just in the ancient period. It was a time of great intellectual ferment, with rival schools of thought competing with one another. Amongst these was Confucianism, which would in due course become the supreme ideology in successive Chinese dynasties. Other schools of thought, particularly Daoism and Legalism, would also directly or indirectly influence later ages. This was also the period in which the roots of that distinctly Chinese style of government, characterised by officials chosen on the basis of intellectual merit, can be traced. The various cultural and social strands were developed in the final phase of ancient China’s history. This was characterised by the rise of strong, centralised states which unified the Chinese cultural area under a single imperial dynasty. The Qin dynasty emerged as the first unifiers of ancient China from the constant warfare between the different regional states of the late Zhou period. The Qin is famous for imposing a rigid unity on Chinese society, and in building an early version of the Great Was of China. However, the Qin regime’s very rigidity made it a short-lived dynasty. It was brought down by regional forces which it had failed to tame and by a peasantry which it had ruthlessly exploited. The next of these unifying dynasties, however, would rule China for some 400 years. This was the Han dynasty, arguably the most important of all China’s dynasties. Under the Han emperors the Chinese became so used to being ruled as a single nation that to this day they call themselves the Han people. It was under the Han that Confucianism triumphed over all the competing schools of thought which had emerged in the later Zhou period to become the ruling ideology of China. An empire-wide bureaucracy, staffed to a large extent by officials recruited and promoted on merit, and imbued with Confucian thought, came to govern China. Closely linked to this, the roots of the exam system by which officials were recruited can to traced back to this period. The Han dynasty lasted until 220 CE, when it broke up into several successor states. This opened a period of weakness for China, when no single dynasty was able to establish its rule over the whole country, and when barbarian peoples from surrounding regions were able to found a multitude of states within China. This was a dark period in Chinese history, but by no means as dark as the period which followed the collapse of the western Roman empire in Europe. Society was disrupted, trade declined and many cities shrank, but even in barbarian-occupied areas administration staffed by Confucian-educated officials continued to govern, and Chinese civilization continued largely as before. Within just a few centuries new dynasties would arise to once again rule China as a single empire.